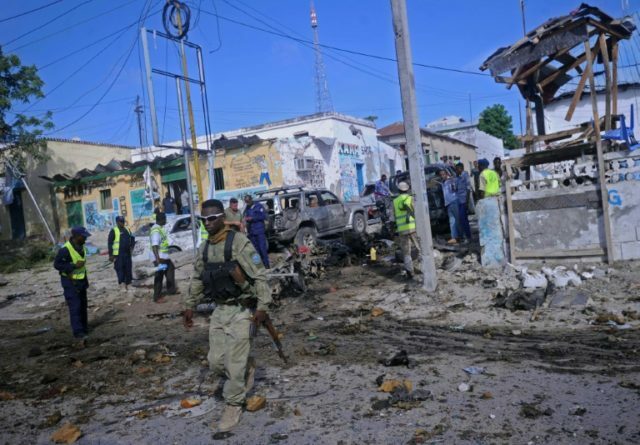 Mogadishu (AFP) – Shabaab jihadists attacked a Somali army base early Friday in the southern town of Barire, killing at least eight soldiers and stealing equipment, officials and witnesses said. The assault on the Somali National Army military camp in Barire, around 40 kilometres (25 miles) west of the capital Mogadishu, began with two suicide attackers detonating their car bombs before gunmen overran the base. “There was heavy fighting this morning,” said Mohamed Haji Ali, a Somali military commander, confirming the attack to local media without providing details of casualties. Residents said the attack left bodies of government soldiers scattered on the ground while Shabaab fighters looted the base stealing vehicles and weapons. “There were dead bodies around the military camp and I counted about eight of them from the Somali military but it could be more than that,” said Abdulahi Muktar. Another resident described hearing two large blasts followed by heavy gunfire. “This attack was very sophisticated with the militants raiding the base from three directions, there were two huge blasts presumably suicide bombs,” said Mohamed Malim. SNA forces had only established the military outpost at Barire recently after taking control of the town in August with the help of African Union troops. The Shabaab claimed the raid in a statement, confirming the use of suicide bombers. “The attack started with two suicide bombings,” the militants said. “The Mujahedeen fighters forcefully took control of Barire, they destroyed the military base and confiscated about 11 vehicles, five of them mounted with machine guns. The Al-Qaeda aligned group has been fighting to overthrow successive internationally-backed governments in Somalia for the last decade and carries out frequent attacks on military, government and civilian targets.